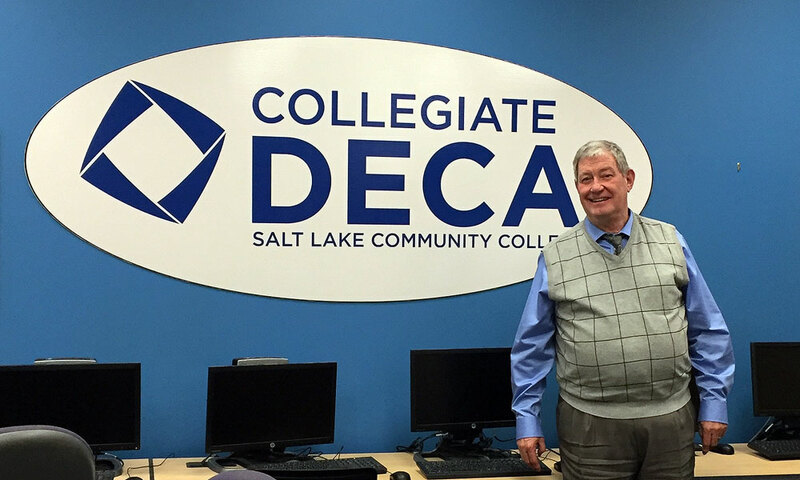 After teaching marketing courses for 37 years at Salt Lake Community College, Professor Curtis Youngman will retire on June 30, 2016. Youngman earned his associate degree from then-Weber State College before receiving his bachelor’s and master’s degrees in Marketing Education from Utah State University. He has served on the National DECA Board of Directors for five years, as the State Collegiate DECA Advisor for 11 years, as a Local Chapter Advisor and Co-Advisor for 40 years, and on the American Vocational Association National Marketing Education Policy Planning Committee for five years. I met Youngman in his classroom after his afternoon consumerism class April 19 in the Business Building at Taylorsville Redwood Campus. He looked professional in his long-sleeved blue dress shirt, slate-grey slacks with matching tie, and light grey sweater vest. But what was most memorable was his gregarious personality. We exchanged pleasantries at the opportunity to meet together, then got straight to the business of discussing his tenure at SLCC. What classes have you taught at SLCC? What do you think has been the most enjoyable aspect of teaching at SLCC? What has been your impression of the students here? What changes have you seen take place at SLCC during your time here? Can you give examples of what they’ve tried to accomplish that you’ve seen be successful? What do you hope you most influenced students to accomplish? What kinds of things did you do as you tried to help make that happen? What are you looking forward to doing after you retire? What memories of SLCC do you think will stay with you the longest? What words would you use to describe those feelings? If you could get one message out to your students, what would you most want them to know? At the conclusion of our interview, Youngman provided me with a copy of The School of Business’s April 2016 newsletter that announced his retirement. But what he was most eager to share was a story on someone else in that issue – one of his former students, Tulia Ibanez. He opened it up and pointed out where Ibanez had been chosen as Spring 2016’s Outstanding Student in Culinary Arts. That’s Youngman for you: the humble instructor, celebrating his student’s success to the end.